Thanks for stopping by for another wonderful color Challenge from the Play Date Cafe. This week the Cafe is being sponsored by Memory Box. 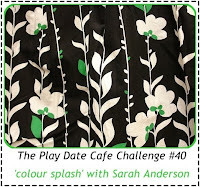 This week Sarah gave us a wonderful Splash of Color Challenge - GREEN being your splash. Keep reading for details on how to play along! The winner of this weeks challege will recieve the beautiful Damask Butterfly and Inspire Butterfly Collage (I've used both stamps in my post today). 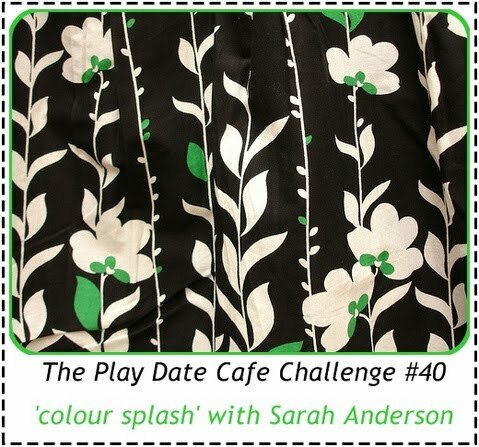 The Play Date Cafe designers all used these wonderful images for today's challenge! I stamped the Inspire Butterfly Collage image in Crushed Olive on a piece of SU retired pattern paper, added the Black Flourish Gems, and the Damask Butterfly with dimensionals. You gotta love when cards go together so quickly! Here's this weeks Color Story Photo,we'd love for you to play along with this weeks challenge at The Play Date Cafe, you can find all the details here on how to enter. If you upload to any online gallery please use keyword PDCC#40 so we can find your creations! Click here to visit the Memory Box Blog. Gorgeous design for this week's colors, Lisa : ) Really love all the dimension and elements you added. Gorgeous background to your beautiful butterfly! Beautiful and elegant card! So happy to have had time to chat at CHA! Beautiful. I love the background and all that bling. So soft and elegant! Beautiful butterfly and perfect as always! Love it! This card is STUNNING! I just love how beautiful you make your cards--I'm so CAS! I wish I was this talented--and could make plain paper SPARKLE!! You are amaZING! This is such a beautiful piece of art! I can't tell if it is framed or not! Is it? I love the bg, and the bling is a beautiful addition to the gorgeous butterflies! Girl this is georgous. I love your color combo and I love these georgous butterflies. Truly gorgeous! Love the butterfly! This is BEAUTIFUL Lisa, so elegant, LOVE it! SO jealous I can't get to CHA, would love to meet everyone! Maybe another year! Beautiful card, my goodness all the details are just gorgeous!! Wonderful inspiration. I LOVE how you used the two different butterflies on your card and, of course, all the bling!!! FAB FAB card! I think all of the designers really outdid themselves this week! Or maybe it was the FAB stamps you were given!!! This is so beautiful! I love the black swirly bling and the way the butterfly appears to float right off the page. Gorgeous! Such a lovely card, Lisa! Beautiful background and love those fabulous gems! Great card, as always, I appreciate your comments on my entries. I'm here to say hi b/c Savannah is sharing love with her "Fav" gals and I picked up from the PDC to say hello to.